A high quality lower parts kit needed to assemble your AR-15 lower. Parts are made in USA! Assembly takes place right here at our new facility in Columbia, SC. New Gen 2 Kit!! Features black oxide coated hammer and trigger springs. Features black oxide coated hammer and trigger springs. I am thinking of purchasing 516445899 a complete upper, I have an Anderson stripped lower, and a magazine. I wanted to make sure that this will complete everything I need for a complete operational rifle? No. You will still need buffer assembly and buttstock assembly. Look a purchasing a lower build kit. will this kit work with an pa-10 stripped lower? BEST ANSWER: Not really. That kit is for an AR-15 lower, and only some of the parts will interchange. Get the kit specifically for the PA-10. Some parts are interchangeable, but overall the kit will not work. Can I use this kit with your PSA 224 stripped lower? Yup. The only thing youll need outside of a 224v barrel is a 6.8spc/224v bolt! Hello, yup, it will all fit. It worked fine on my lower. All went together okay, but the teigger pull is awful. I need to take them back out and hand fit the contacts and smooth it all out..
Every part fit great, no shortage of parts, it even came with an extra take down spring and pin , smooth trigger pull. I have used several PSA lower build kits and they all have worked great. Great lower group. Quality parts for a quality build. Bought the lower from PSA, then this build kit. couldn't have been easier. Everything fit together perfectly. It was my first time building an AR and having parts fit like this made it a breeze. I highly recommend PSA to anyone. way better then I expected ,top quality ,better priced then any gun show I ever been too ,all the parts fit very well and worked great . Great value and fast shipping. I bought this to put together a 80% lower I did and all fit well and very smooth action and the price was the selling point. Works great. No issues at all. Price was great. Quality product. yes, would recommend it to everybody, it came with an extra takedown pin and spring, a part that is lost very often in a build. I have purchased other lower parts kits and had the hassle of not getting all the parts. Will never order from anyone else but Palmetto state! The lower parts kit from PSA are the best on the market. Perfect fit. It was very easy to put together. I would definitely recommend it. Can’t wait to shoot it.. Went together perfectly. Everything works as it should. Great kit. great lower build kit everything went together perfectly on an Anderson striped lower the only complaint was the grip the finish was rough went in the trash installed a grip from left over build parts from another build. Great parts kit as always!! Nicley packaged and everything fit and worked wonderfully as always! The kit made it easy to install and had a great feel on the trigger. Part are all well made and every thing I have used so far fits nicely in my lower. Bought this kit to build my first AR. Loved the individual wrapped packages and the online video was a great help. I now considerer it my "go-to", quality, Lower Parts Kit. This had everthing need to finish the job. I liked that it had extra springs and detents (the ones you always lose). Great price! I would recommend this to anyone. I believe PSA. Is the firearms and parts company I trust for a good product. I have made several purchases from PSA and will in the future. Received the stripped lower quickly, very excellent quality the PSA lower parts kit I bought later assembled perfectly. No flaws on finish. Went out on a limb for this kit being that it was so inexpensive. 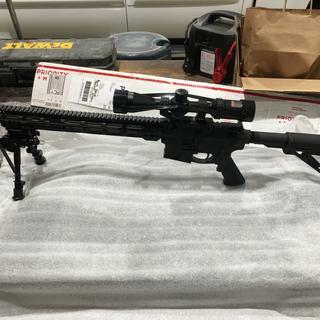 This is my first full build and the parts look great have not had a chance to assemble the lower yet but all parts are there and accounted for.....along with some spares which is awesome to see that they do that. All parts are separated nicely in plastic bags and look to be of nice quality. I read people saying PSA takes long to ship.......from ordering the parts to getting them at my door it took under 3 days seems like FAST shipping to me!!!! Thanks PSA I will certainly be looking at parts from you guys again based on this experience. Missing parts= trigger guard pistol grip screw and lock washer disconnector spring. Bolt release part needed slight filing to fit properly. Called Palmetto after long wait for customer service they did agree to send missing parts in eight to 10 days. Excited to start building my first and only AR15... in California :( and received the parts kit obly to find its missing most of the springs. Also received duplicate parts so someone in QA wasn't doing their job. Sent an email and we'll see if Palmetto can redeem themselves with a quick fix and overnight ship. The disconnector is a stamped part with the hook that holds the hammer partially missing because of the stamping process. The hammer pportion that interfaces with the disconnector is the old style narrow. I had to buy a new DPMS hammer and disconnector. By the time I was done the initial price didn't look very good. 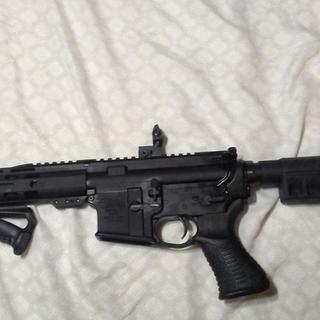 I would suggest the PSA takes a look at the DPMS parts to see what good parts look like. The latest classic parts kit I received did not resemble those of the past. The detents and springs were all black as opposed to the classic metal color I'm used to and they didn't seem as smooth when I put them together. I think I may have gotten something else by mistake. Just stick with PSA ! They are an outstanding company and will go the extra mile to keep you happy . Trigger bis actually better than expected from being milspec. The only issue I have is with the roll pins. They are slightly bigger and aren't chamfered very good. Not a big deal but I did not use the roll pin for the trigger guard. It definitely would of snapped one of the ears off. The rest of them there's enough aluminum on the lower not to worry about that happening. I want to start by saying this is a good quality kit clean edges no brittle parts... etc. etc. Now for the bad it took 14 days to ship out! Not on a big sale or a holiday! Then shipping was another 6 days but that is not PSA fault but wow 14 days that is a long time! My first build and this kit was amazing. I put it on an Anderson Lower and had no problems with the grip. I did however have a very tight fit with the bolt catch roll pin and had a hard time getting that into place. But that could be my inexperience. I received my parts kit to use on my PA-9 stripped lower. Parts were separated in multiple bags for different sections which was convenient especially when I would have unneeded parts for this particular build. Everything fit nicely. Trigger has a clean break with no "grittiness"! Will buy again! 1st build - happy with it. Decided to build a couple of lowers. Got the receivers and ordered two kits from PSA. Dealt with the typical forever shipping (NINE days from payment to my door) from PSA but the parts are very nice and fit into my Anderson lower perfectly. I know when I order from PSA not to be in a hurry but they usually have the parts/stuff I need/want and the prices are usually pretty good. Either way still getting 5 stars. If I get a few more quarters to rub together I'll get a couple more kits and probably build a couple more lowers before 'she' gets in the White House. Good luck. The surfaces between the hammer and disconnect both looked pretty bad right out of the box. When I got it assembled the trigger would not reset. It's not that big of a deal but its disappointing when you purchase something with the expectation that it will work as it is and the machining was completed. Next time I will buy a higher quality trigger control group and toss these in the parts box. I caught this kit on sale and installed it on an Anderson lower. The project brought back memories from my Army days. The only thing I had trouble with was getting the grip to fit tightly. I used a shorter screw which solved the issue. I could have used washers but the screw was readily available in my spare parts box. My brother who retired from the Sheriff's Dept. and was also the Armorer recommended this kit. He is also the person who alerted me to PSA and he has used this kit on several occasions. I found the quality and price to be a fantastic value. I'll be saving to buy my upper from PSA in the very near future. I HIGHLY recommend this kit. The LPK is solid nothing wrong with the components other than the grip screw. It is way too long and bottoms out in the lower on both a Spikes lower and an Anderson lower. Will need to add washers in the grip to act as spacers. Purchased two of these kits to build 2 lowers. Love the kit great quality. Need another one but patiently waiting because they are temporary out of stock. As a Veteran Ive spent some time with an M16. 25 years later Im finally getting to put together the rifle that I cant forget that just....is. The lower parts kit arrived yesterday. So I turned on the stereo(Im Old) sat down and had a blast installing this kit into a FMK composite lower. It went together exteremely smooth. Having been a Quality Assurance Inspector for the last 20 years in manufacturing with a back ground in Test Engineering I was impressed by the finish of the parts as I removed them from the package. And even more so after I assembled them into my lower. I understand what I purchased. The cost effective parts kit shows an attentive manufacturing process. 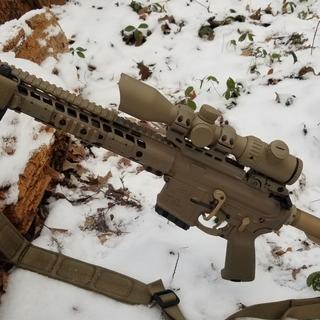 I will be happily bringing this rifle up to operating temperature this weekend outback in my lower pasture and grinning ear to ear. Palmetto State Armory Has found a way to to make things obtainable for the common people. Keep us the good work folks. I've bought 3-4 of these they fit better than the Anderson lpk IMO. I live in central CA so they take a minute to get here but nothing like some people maybe 7-10 days MAX. I've used several of these PSA lower parts kits and every one of them has arrived to me within a week of ordering. All parts have been included in the kits and for the money they can not be beat IMHO. I've noticed the stampings on the trigger and hammer are the same as some of the rifle makers out there. Great kit for the money. At $49.99 on sale you can not go wrong.